We supply products and materials for all aspects of sound control. If you need to tame reverberation and echo problems, you will need sound absorption panels. We have high quality panels in many sizes and colors. An elegant combination of personalized artwork and acoustic treatment for commrcial envioronments. These panels are used to improve overall sound performance, and to quiet “noisy” spaces. A top of the line specialty acoustical wall and ceiling wood panel systems used to create exceptional environments utilizing the natural splendor of wood combined with superior acoustical performance. Noisy fans, loud air handlers and vibrating motors are all sources of noise pollution and distortion. We carry several lines of products to control vibration. 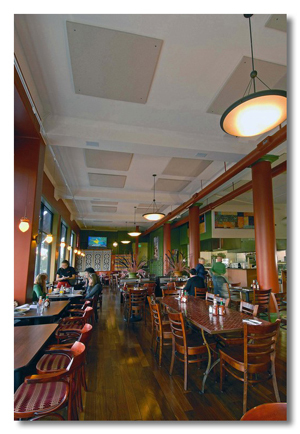 Sound reflection control and noise control take a San Francisco restaurant from loud to comfortable. "MSR made my restaurant comfortable."